As I sat this night on the corral’s fence, in the quiet night, the only sound to my ears were the bells of my beloved horses walking in the dark, I raised my eyes to the sky. At first a few lights started to appear above me, scattered and shy to the human eyes. It’s only after a couple of minutes that quietly and slowly, more and more came populating the night. What more do you need when you find balance in your life? You just have to define your interests, be true with your goals and find a meaningful purpose for your life. What more do you need in your life to be fulfilled and die without regrets? Well my answer would be nothing. Happiness truly resides in small things, and as we know, happiness is only real when shared. As small as stars looks like from down here, if you keep waiting and watching, they will start to blink, and more will come to your eyes. Their magic will then do the rest, don’t waste your time searching, just lay down with your eyes open and watch these natural illuminations moving slowly above you; soon enough shooting stars cutting the sky in two will enlighten your night. The picnic table in front of the barn at the ranch is a great spot for that. I spent more than four months at the ranch and during the first three, I spent more time in the bush than at the ranch. I feel more comfortable in the wilderness, surrounded by untouched nature and wildlife, where only nature’s laws apply, where your horses are your first priority, when time is only governed by the sun and moon cycles, and the only sounds to your ears is running water and animals, but in society nowadays, what was usual activity decades ago, is today only a week long activity for tourist who want to reconnect with what our society pushed away from us and destroyed. We’re all part of the problem today, and as more and more of the people recognize it, get more aware of it, and come to take our pack trip to experience and reconnect with nature and wild surrounding, we are still a bigger part of the problem than of the solution. I’m careful about what I eat and consume, what I buy and how it is produced, but for example I’m still wearing 100% cotton clothes sometimes. Do you know what’s involved in the production of one standard t-shirt? You need 2500 liters of water, against only 50 for a tee-shirt with recycled products. To produce that one shirt, you need to grow and cultivate cotton, put pesticides on it if not organic, then harvest it, clean it, make a string out of it, then a fabric, cut it, put it together. It’s not easy to change our habits all in once, but slowly we can change and contribute to make this dying world a better one for our next generation. 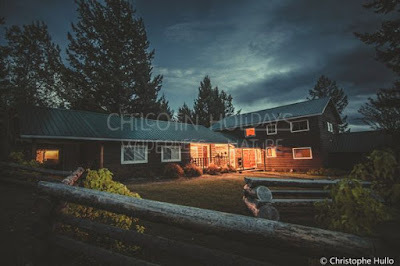 Guiding people from around the world, and working at the ranch, being a part of conservation in the South Chilcotin Mountains makes my goals and main purpose in life shift towards something bigger and more meaningful than what I had in mind before coming here. Evolving in the wild shapes your mind in a peculiar way, especially when your primary colleagues that help you to survive in that environment are horses. You build a relation with them, they know the region and the trails more than you do, they feel danger before you, they can bring you home safe in the darkest night if needed, and your horses paired with your skills are the only thing you can trust into the wild. Relying on only these few things carve a feeling in your mind towards nature and wildlife that you can only feel by experiencing it yourself. That’s what I like the most in guiding people from all over the world and sharing with them my passion for the outdoors; but also my fears and anger about what we, as human, are doing to this amazing and breathing eco-system. As I leave the ranch with a lot of new experiences, memories and personal achievement, my old purpose in life which was about changing the world in one way or the other is today more defined, conservation of our land and wildlife is one of the most important things we have to care for. One of our guests said a few days ago that he told his children that they can do whatever job they want as long as it is a technical job, because humanity will always need plumber, and carpenter etc, but not so much social oriented jobs. My personal opinion on that is, in a way I can agree with that in the short term, but in the long term, technical jobs won’t matter if there are no more animals on earth to feed us, and no ground on which to cultivate or walk, or pure air to breathe. Conservation of our mother earth is a priority, you can choose to act and do something positive, or just watch species getting extinct one after the other, glacier melting, humans starving, and fossil energy getting emptied. If you come at the ranch, I hope you’ll understand, while riding your horse and watching the wilderness around you, that we need to act if we want to continue enjoying it.